Ghosn, 58, doesn't plan to commit to Nissan's next mid-term plan and investor-relations officials at the automaker have told investors and analysts there is a succession plan in place. TOKYO (Bloomberg) -- Nissan said CEO Carlos Ghosn is considering stepping down before the company's next mid-term business plan begins in about five years. Ghosn, 58, doesn't plan to commit to Nissan's next mid-term plan and investor-relations officials at the company have been telling investors and analysts this year that there is a succession plan in place, spokesman Koji Okuda said. Ghosn is also CEO of French automaker and Nissan partner Renault. "Ghosn has said this is the last mid-term plan he'll commit to, meaning he may not stay here for the next mid-term period," Okuda said. "We need to prepare for his possible departure within a five-year period." His successor would follow in the footsteps of an executive credited with one of the biggest turnarounds in modern automotive history. Ghosn, the second-longest serving CEO of a major carmaker, joined near-bankrupt Nissan and turned it into a carmaker leading the industry in profitability, with its market value reaching as high as 5.73 trillion yen ($72 billion) in 2006. "Top resignations in Japan tend to have less impact than those abroad because Japanese companies are run collegially, but Nissan is clearly different," said Koji Endo, an auto analyst at Advanced Research Japan. "Ghosn's retirement would mean the loss of a strong decision maker for the time being." The current business plan, which began last year and lasts through March 2017, is Ghosn's fifth multiyear campaign at Nissan since his arrival 13 years ago. The current Power 88 plan calls for Nissan to generate operating profit margins of 8 percent and grab market share of 8 percent globally, including 10 percent in China. It also calls for Nissan to churn out a new model every six weeks and reduce costs 5 percent each year. Renault Chief Operation Officer Carlos Tavares, formerly head of Nissan's operations in the Americas, and Renault Chief Financial Officer Dominique Thormann, may be considered candidates to replace Ghosn, according to a Nissan executive who spoke on condition of anonymity. Asked about Nissan's leadership plans during an earnings conference call with analysts in May, Ghosn said investors should expect to hear more about the matter in shareholders' meetings. Nissan's next annual general meeting of shareholders is on June 26. Ghosn's 12 years as president of Nissan makes him second only to Suzuki CEO Osamu Suzuki in terms of tenure running a major carmaker, according to data compiled by Bloomberg. Ferdinand Yamaguchi, a freelance columnist, wrote in a book entitled "Eigo Dake Dewa Dame Nanoyo" published last year, that Ghosn told him that this would be the last midterm plan he would commit to and that it's unlikely he would remain CEO in 2017. Carlos Ghosn was born March 9, 1954 in Brazil, where his father, Jorge, ran a small airline. His mother, Rose, was born in Nigeria as a French citizen and met Ghosn's father in Lebanon. Rose returned to Lebanon with 6-year-old Carlos in 1960, enrolling him in a grade school and then a high school run by Jesuit priests. He attended college in Paris at Ecole Polytechnique, France's most prestigious engineering university. After receiving an engineering degree from Polytechnique in 1974, he earned advanced degrees in engineering from Ecole des Mines de Paris and in economics from the Universitie Paris X-Nanterre. He said in an interview in 2005 that he especially loved the time he spent in the Latin Quarter of Paris, as well as a summer as an exchange student in Colorado Springs, Colorado. After finishing school, Ghosn spent 18 years at Michelin & Cie, Europe's largest maker of tires. He survived hyperinflation to make Michelin's Brazilian unit the company's most profitable in 1989, and steered the North American unit through a recession and the acquisition of Uniroyal Goodrich Tire Co. in 1990. Six years later, headhunters came calling from Renault and Ghosn accepted a job as an executive vice president. In the next three years, he wrung 3 billion euros in savings out of its operations, earning him the nickname "Le Cost Killer." In 1999, Renault bought a controlling stake in Nissan and put Ghosn in charge -- first as chief operating officer, then president and CEO. At the time, Nissan's net debt totaled 2.6 trillion yen -- more than double shareholders' equity -- its factories were standing half empty and its market share inside Japan had been dropping for 27 years. Bob Lutz, former vice chairman of GM and chairman at Exide Corp., said at the time that Renault would have been better off dumping cash into the ocean. Then Ghosn began cutting Nissan's costs, including the elimination of 21,000 jobs -- one in seven -- and closed three of Nissan's seven Japanese assembly plants. He turned a record 684 billion yen loss in the year ended March 2000 into a 331 billion yen profit -- then a record -- a year later. Each of the ensuing five years resulted in a record profit, peaking at 518 billion yen in the 12 months ended March 2006. None of the world's biggest automakers could match Nissan's operating profit margins at the time. As Nissan's profits grew, so did Ghosn's popularity. Shoppers would line up for photos and autographs when catching him buying groceries in his Tokyo neighborhood. He'd be greeted to thunderous applause upon arrival local soccer stadiums and he even became the subject of a comic-book biography that reached 300,000 Japanese readers in monthly installments in 2001. When Le Journal de l'Automobile named him Man of the Year at an awards ceremony in Paris in 2002, hundreds gathered in a receiving line. His popularity also grew in the corporate world. He twice turned down overtures from Ford to join its company as a top executive, people familiar with the matter said in 2005, the same year Ghosn also became CEO of Renault. In 2009, President Barack Obama's administration invited him to run General Motors, a job Ghosn said he declined with "no hesitation." In 2010, he began staking Nissan's future on electric vehicles, and has since said that 1 out of 10 cars sold in 2020 will be electric vehicles. He pledged to spend $6 billion on EV technology from 2007 to 2011 -- an amount equal to the combined annual research and development budgets at Nissan and Renault. As of May, Nissan had sold 32,000 Leaf electric vehicles since the first one rolled out in December of 2010. Not everything Ghosn did succeeded. Talks to form a three-way alliance between GM, Nissan and Renault collapsed in 2006. In 2000, Nissan spent $1.4 billion to build a factory that years later would build the Armada sport-utility vehicle, ranked six years later by Consumer Reports magazine as the least reliable vehicle in the United States. In 2011, Ghosn accused and fired three Renault executives of spying, only to have the allegations discredited by a police investigation. 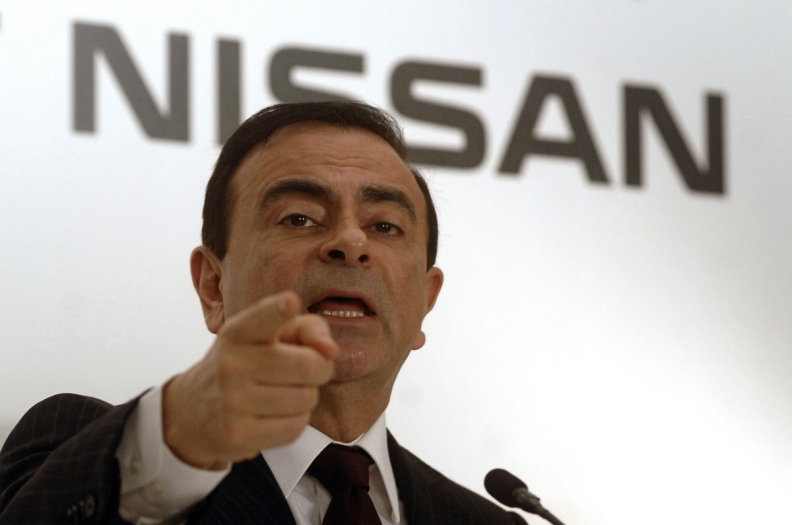 Ghosn apologized publicly and his deputy at the time, Patrick Pelata, stepped down for his role in the dismissals of the accused executives. Still, Ghosn's overall track record has earned him the confidence of investors, according to Koichi Sugimoto, an analyst at BNP Paribas SA in Tokyo. "If it happened suddenly, the stock would plunge, but we are expecting a smooth transition," Sugimoto said. "Ghosn has been a strong leader, but at the same time, Nissan has been sending out the message that it's structurally sound thanks to its human resources cultivation system."